Um, right. Missing your daughter’s school presentation so that you can give an interview for your book about being a dad. Not a commendable application of the concept of irony. 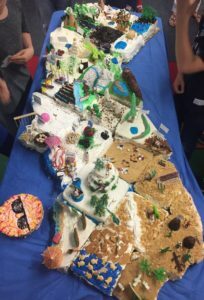 What I did not know is that the cake would be fully assembled on a giant table in class and that that the kids would then perform an hour-long, choreographed, California history lesson extravaganza, complete with songs (plural) and recitations, each student with their own lines. I know this now only because I cancelled my 11:00 AM radio interview and opted to attend the school presentation. After, parents and students gorged on high calorie hunks California counties and Dessa showed off her school work. Lost worktime, expensive. Disappointed radio host, unfortunate. Video of my daughter and her schoolmates singing “Eureka” – excellent fodder for embarrassing her when she is a teenager. So I made the right choice on the second try. This would be a theme for the day. With the morning gone, Dessa released from school early at 12:30 PM, and another interview appointment at 3:30 PM, the day was pretty much killed for work. So I opted for some daddy logistical efficiency. For weeks I’ve been trying to find time to investigate a short list of local martial arts schools for Dessa. Summer break is now only four school days away and the pressure’s on. So I thought that we could squeeze in a few essential errands and then check out two martial arts schools, returning to my desk and phone just in time for the afternoon interview. When you are a daddy, plans don’t always explode. Often they die by maddening inches and minute by minute delays. First snafu: Our California cake decorating obsession with the pier proved to be a major tactical error. Other families had not allowed dad to take power tools to popsicle sticks. Wiser families had encouraged more edible decorations. A mound of crushed Oreos for the volcanic geology of Lassen National Park. Green marshmallow trees for the Sequoias. A candy-studded frosting mountain for the Hollywood Hills. The bottom line is that Pismo Beach wasn’t a crowd favorite, and there were serious leftovers of the part of California baked and decorated by my daughter. There was no way she was going to let me throw away the cake. There was no way we could drive around for three hours in the car with it. So we had to bring the cake home first. OK. Quick in and out of the house, I thought. Put the cake in the fridge, brush teeth, potty break, head back out. Did I mention that my daughter had a school fair event last week? Did I mention that among the items she acquired at this fair was a squishy balloon about the size of two fists full of some kind of jellied beads suspended in a viscous fluid. When she brought this thing home, I eyed it with suspicion, knowing it was a disaster waiting to happen. But such was her enthusiasm that I let the damned thing into the house. So I’m in the kitchen making fridge space for the wreckage of Pismo Beach when I hear a muffled , summoning grunt from my daughter’s bathroom. I continue to wrestle with Pismo Beach and the grunt comes again. I holler: “Dessa, I can’t understand you. Come here if you need help.” That gets me a third, louder, more acutely desperate grunt. I put Pismo Beach on the counter and head for Dessa’s bathroom, where I find her with her toothbrush in her foamy mouth, her arms up in the air. Her clothes, the counter, the sink, the floor, the shower curtain – all were covered with gooey, slimy little jelly-like orbs, sticky, glittery viscous fluid, and bits of burst balloon. I used some choice phrases that we call “lazy words” in our house. I said them with feeling and emphasis, setting a sound example of proper diction for my daughter. Then I got out the shop vac, paper towels, cleaning spray, and plastic bags while Dessa disrobed. Forty five minutes later, finally in the car, I asked Dessa what we would learn from this experience. Dessa sagely opined that liquid filled balloons are not a good toys to keep in the house. I agreed. I soberly agreed with Dessa about the balloons. Then I suggested two further observation. I asked her if getting upset about the bathroom baloontastrophe had helped us clean up, made us feel better, or saved any time. We agreed that it had not. That was the first observation. My second observation was to point out to her that we can learn from bad examples as well as we can learn from good ones. I cited my exceptionally well-enunciated use of “lazy words” as such an example. Dessa generously agreed with me that I had, indeed, set a bad example. We had only enough time left to visit one martial arts studio. It was more of a drive than I’d hoped and, of course, when we got there, they were closed. So we peered in the windows and I called to leave a message asking when they were open. As I got back in the car to drive away, I confess that I was silently reviewing my inventory of lazy words. Then my phone rang. It was the Sensei. We had a great conversation about discipline, harmony, and self-mastery. We set an appointment for a few days from now, a few hours after the bell rings on Dessa’s last day of fourth grade. Later that night, I ate some of Pismo Beach. Dessa and I had used a double recipe to make the cake big enough, and when I had looked in the oven to check the cake, the center had partially collapsed. The result was that the cake nobody had wanted and which had wreaked havoc on my schedule was spectacularly pudding-like in the center, from which I had cut my piece. An author I love penned a character who once said: “To enjoy the flavor of life, take big bites. Moderation is for monks.” I did.